Port Elizabeth - Springbok fullback Gio Aplon says while he would like to impress new Springbok coach Heyneke Meyer in the third Test against England in Port Elizabeth on Saturday, he would not do it at the expense of the team. "I’m looking forward to Saturday and hopefully to also get the ball in hand and be an asset to the team," Aplon said on Wednesday. "And not be selfish to try and prove yourself and go on your own. "You want to help the team do well within the structure and add your own special talent." The Stormers utility back will be Meyer’s third fullback in three weeks after Zane Kirchner and Patrick Lambie have been ruled out due to injuries. There had been outrage from fans and especially from the Western Cape when Aplon initially did not make the cut. The small player has been one of the in-form South African players in the Super Rugby season but his slight build was perceived to count against him. What Aplon lacks in physicality he makes up with superb vision and fleet-footedness, and he has the ability to cut the opposition’s defence in half. Aplon said he was disappointed not to receive a call-up at the start of the series but he did not have an attitude of expectancy. After Kirchner was ruled out for the second Test, Aplon was called into the squad and he will now receive his opportunity to stake a claim for the fullback position. "Obviously you want to be involved. 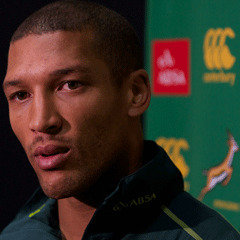 I think this is the pinnacle and you want to play for the Springboks every time you get the opportunity," he said. "It was a bit bleak not to play the first test but it was also good to watch the guys doing really well, but it was awesome to be on the plane the next Monday to Joburg and join the squad." Aplon said he was not better than the players that started before him but it was still his aim to be the best in the country. "As a rugby player you want to improve every single day and improve every single time," Aplon said. "The coach also tells the guys that you are not secure of your place in the starting XV and the 22. "That is a healthy pressure just to push yourself, because it is easy to go into a comfort zone and later you find that you are not playing at your best and then you have to recover again." The 29-year-old said he relished the opportunity to play behind a pack of forwards that ensured go-forward ball for the backline players. The Boks demonstrated in the first two Tests that they can play both physical and an expansive rugby. This was something Aplon felt was encouraging and would fit in with his style of play. "If one looks at the first two Tests how we kept the ball in hand it is actually good," he said. "It is exciting to see how the forwards get over the gainline and you get good ball."